Many of us thought the “Philadelphia” LGBTQ Pride flag with its additional black and brown strips at its top, aimed to “center the experiences of queer people of color” within the movement was a one-off, and perhaps a good one at that. Well, it’s catching on, to the point where it is hard to find a pride meme not using it. This is not necessarily a good thing. Whether or not the modern Pride experience feels like it centers around certain population, the flag itself is a reminder that love and tolerance are supposed to transcend skin color. Why should only certain skin colors suddenly be represented on the flag for all of us? Even the words “black and brown” used in this context of people is hardly sufficient to capture the diversity of the human experience, especially when any given person may descend from mixtures of these broad swaths and others. You could make the scientific argument that “white” is the the sum of all of the remaining rainbow colors, and thus is itself on the flag (because prisms, yeah), but that hardly solves all the problems. Secondly, why should only queer black and brown people be represented? What about the rest of American straight and cis black and brown people? We need to change the American Flag to represent POC liberation. So here is the NEW United States POC and Passing Flag. Please use it immediately and rip down any obsolete US flags you see–physically or in digital space–to make way for the superior replacement. The Star Spangled Banner will now be inclusive of black, brown, and passing people. The United States flag already has stripes by convention, representing the original 13 colonies. It is essential that the black and brown be in the symbolic “colonial space” because they were absolutely part of the colonial narrative, obviously by and large as slaves in all colonies, but particularly in the south. We should not forget that. The major other players in the colonial times were, fittingly, the “white” Europeans and the native “red” (as in Washington Redskins, or the Cleveland Indians chief) population. The remaining stripes are white and red, clashing starkly in contrast. It is a living reminder. Now you might be looking at this and saying, “But what’s that tanned band second from the top?” It may look different on different on different screens, and is tough to digitally represent, but it’s supposed to be off-white to ivory. Distinct enough to notice up close, but white-passing from a distance. This is the band of those who are blended and those who pass within whiteness, but broadly within any population. The Passing band can apply to populations like Ashkenazi Jews, who are not distinctly of white ethnicity, to many people of LatinX origin, to people of MENA origins, and even to albino individuals who are often misinterpreted on the street. Really, why does melanin belong on our flags at all, but hey at least we should also remember that not all racism is dependent on skin color. Jews are a great example: We were gassed by the millions by Nazis, then silly antisemite radical groups have the nerve to lump us in as Nazis in all the whiteness problems they see the world facing. Funny how the Nazis call Jews part of the minority problem and the minorities call Jews part of the Nazi problem. And if you told them there was a country where Jews, Christians, Muslims, Queers, and Women all had rights… they’d wet their ripped up fatigue pants, until you remind them the country’s name is Israel. Anti-racists don’t want it if the Jewish accomplished it… but that’s obviously not racism. We’re talking about America here, how dare I hijack my own platform to talk about Israel? Yeah, people actually stay up at night trying to make their own racism sound sensible. “My racism, the alternative to bad racism.” -Your local radical nut job. So enjoy the new American flag, and start using it, the same way it has become for Pride. If you don’t like this flag, you are the probably the reason it exists. There’s only one thing that is for certain, you can’t be anti-racism if you are only against everyone else’s racist except your own. Certain radical groups should really learn a thing or two before they go crying out to dismantle democracies. But when they build liberated states in their imaginations, er, in their wakes, I’ll be there to draft the flags. Watch my 2017 Austin Interfaith Pride Sermon! This video includes the full introduction by Rabbi Rebecca Reice. Thanks so much to the Austin Interfaith Pride Coalition for the invitation and chance to share some torah and some laughs amid challenging times! Feels nice to have a new article out, even if it is an awful situation. It was just another normal day in the airport security line. This time I was departing Schiphol Airport in Amsterdam. 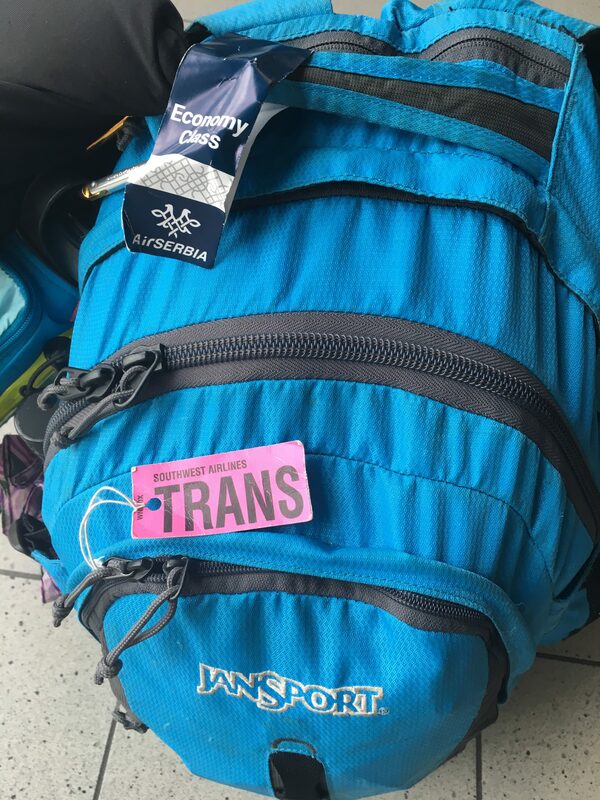 As a transgender woman and frequent traveler, I always opt-out of the new-fangled body scanners in favor of the pat-down. Always.